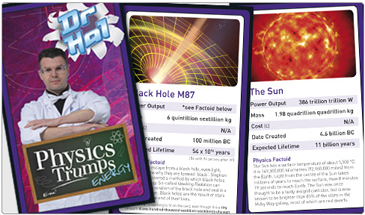 Dr Hal's Physics Trumps was conceived by Dr Hal Sosabowski and researched by Dr Steve Kilgallon, Educationalist at a well-known UK University and moderated by Dr Stuart Ansell, Research Physicist at the Rutherford Appleton Laboratory. There are two objectives in getting children to play with any of the Dr Hal's Science Trumps range. For the pupils/players, the objective is probably to win the game, but clearly there is meant to be a learning outcome, sometimes referred to as camouflaged learning. The games are designed to engage the players through gameplay but also to generate discourse and occasionally mild-mannered arguments about why certain trump factors are the values they are. This can form the basis for an excellent post-game classroom discussion. The Physics Facts at the foot of the cards are designed to introduce some takeaway learning from the games.